I knew going into this competition I wanted to create an interior night time scene that would allow me to play around with contrasting lighting and moods. I had a concept saved away that I had found at an earlier date which featured a style and setting that was not only interesting to me, but would also allow me to achieve the criteria I had set against myself. 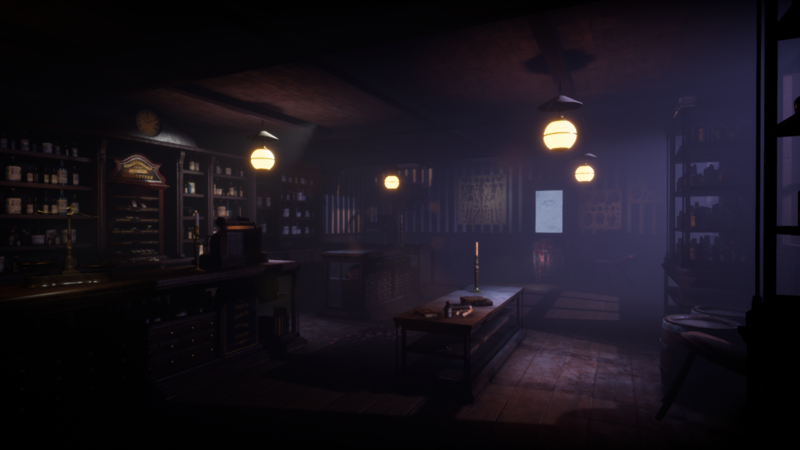 The concept in question is set in a late Victorian apothecary/drug store featuring several unique pieces as well as some more modern features such as electric ceiling lights. The overall mood from the piece is quite dark and eerie and served as perfect platform for me to experiment with some high-end lighting techniques. Unfortunately I wasn't able to meet he minimum upload requirements for the site, as a result I have attathced a google drive link which can be used to access the project.